AMBROTYPE PHOTO OF SOLDIER HOLDING WHAT LOOKS LIKE A. GUN AND A SWORD, case is broken and is 3 1/2 by 3 inches. 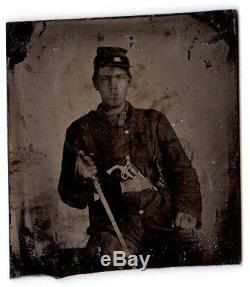 The item "CIVIL WAR NORTHERN SOLDIER AMBROTYPE PHOTO HOLDING SWORD REVOLVER" is in sale since Saturday, February 06, 2016. This item is in the category "Collectibles\Militaria\Civil War (1861-65)\Original Period Items\Photographs". The seller is "look2selling" and is located in Cleveland, Ohio. This item can be shipped to United States, to Canada, to United Kingdom, DK, RO, SK, BG, CZ, FI, HU, LV, LT, MT, EE, to Australia, GR, PT, CY, SI, to Japan, to China, SE, KR, ID, to Taiwan, ZA, TH, to Belgium, to France, to Hong Kong, to Ireland, to Netherlands, PL, to Spain, to Italy, to Germany, to Austria, RU, IL, to Mexico, to New Zealand, SG, to Switzerland, NO, SA, AE, QA, KW, BH, HR, MY, TR, BR, CL, CO, CR, DO, PA, TT, GT, SV, HN, JM.